Apple’s iPhone is not limited to the calls and text. But it is also a superb gadget to catch the photo and videos. It comes with various new hardware materials and user-friendly software pack iOS ecosystem. The important thing is a high-resolution Camera compare to other smartphones. iPhone’s 12-megapixels photos using iSight Camera. As well as shoot 5-megapixels selfie photo by FaceTime camera, also, this becomes helpful when you are calling FaceTime video. Now you can turn on live photos on iPhone XS Max, iPhone XS, XR, X, 8 Plus, iPhone 7/ 7 Plus/ 6s, 6S Plus and supported iPad Pro, iPads. Debuted live photos and 4K Video features in camera by the Apple in its iPhone series. So naturally, all users haven’t an idea on how to use or take live photos on iPhone? Don’t worry. As a new iPhone owner, you will get much new stuff. But here we always tried to explain your every confusion in a Simple text. So today I’m guiding you how to take live photos on iPhone. If we are talking about storage space, then the live pictures take less space than 4k Videos Because 4K video always consumes more bytes in front of live photos. So we recommend you an ibridge drive that keeps you to store your photos and videos on an external drive. Step 1. 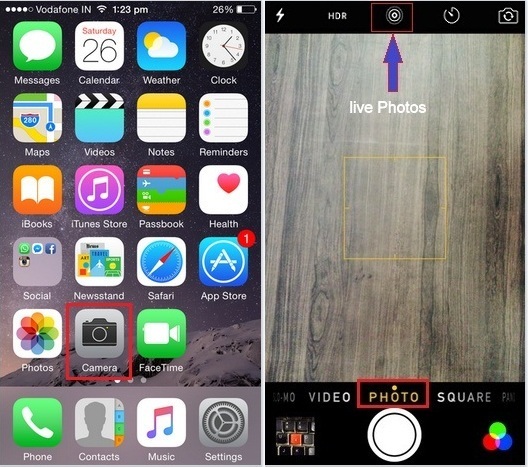 Launch the Camera app on your iPhone. Step 2. Now hold on screen with Photo or Square option to shoot live photos icon. Step 3. Next, tap on live photo icon to enable live photos feature. You can appear your live photos in Photos app in the row of regular pictures. This live photos you can also set as a background animated Wallpaper on all 3D touch supported iPhone. In latest iOS, you can Edit Live Photos on iPhone and iPad to set key photo, mute Live Photo (turn off live Photos Sounds), trim live photos, add filters effect, etc. Step #3. Next, Scroll down the Screen to tap on Record Video. Step #4. in the end, choose 4K at 30 fps or latest iPhone model users have option 4k at 60fps. While you want to turn off live Photos mode then just tap the live photos icon in camera app again. Let share your feeling in the comment box on taking live photos on iPhone.